I get a lot of strange looks as Mom takes me down to the beach, or anywhere, really. 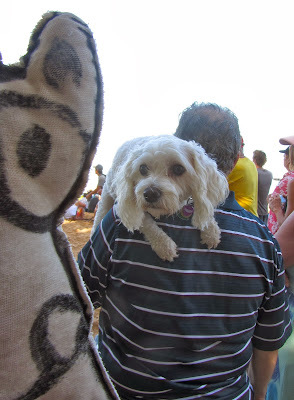 This one from Pineapple, a Bichon from the East Side, was one of the strangest! She was super friendly once she got to know me, and smell me. Safety is alway, always the first concern of any surf contest. At the Banzai Pipeline it's even more important. The waves weed out the men from the boys at this surf spot. Terry Ahui, a former North Shore lifeguard, who owns Pt. Break Water Safety, uses this water vehicle to make rescues and keep an eye on the competitors. He designed the rescue sled behind me! These are only a few of the photographers trying to capture a great shot during the Pipe Masters! 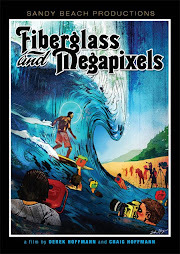 In the past few years, anyone with enough money to buy a good camera with a telephoto lens could take contest pictures and submit them to surf magazines. There were many more men in the water with cameras dodging surfboards and duck diving massive waves! 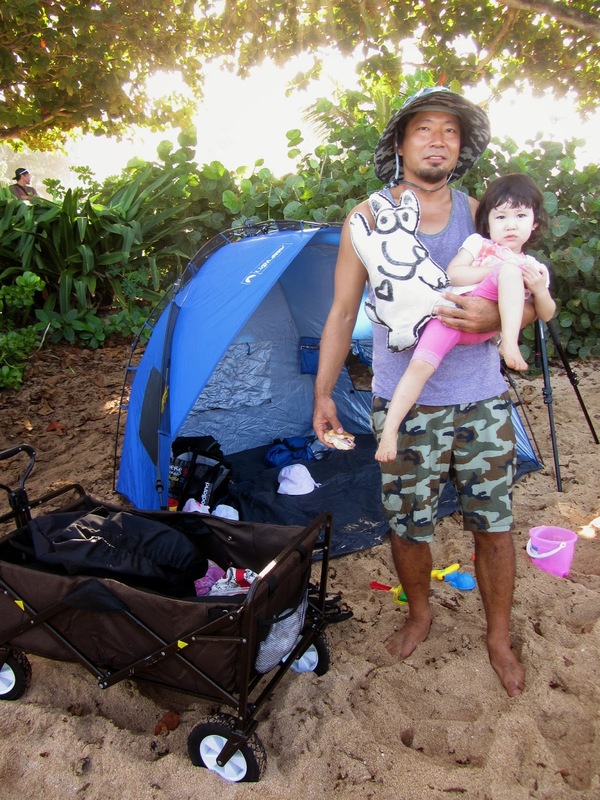 Honolulu residents, Nori, and his daughter, Anela, were decked out in style. Mom was working, so Dad decided to spend the day at the beach. Smart thinking to have a wagon, sand toys, and a tent. It gets pretty hot when the afternoon sun starts beating down and there is no shade anywhere. Antonio, from Brazil, and Ricardo, from Venice, Italy, were so happy to find the best seat in the house to view the Pipe Masters. What do you think, are they in the perfect place? On the Set of Hawaii 5-0? This handsome Honolulu police officer was on duty at the Pipe Masters. Liam Miller loved this "special"duty assignment. When I asked him if he surfed, he replied, "Every day if I can!" Visitors and locals always crowd around the judges' stand. These folks were at the contest early and capitalized on the morning shade. Tom Servais was a staff photographer at Surfer Magazine for over 20 years. 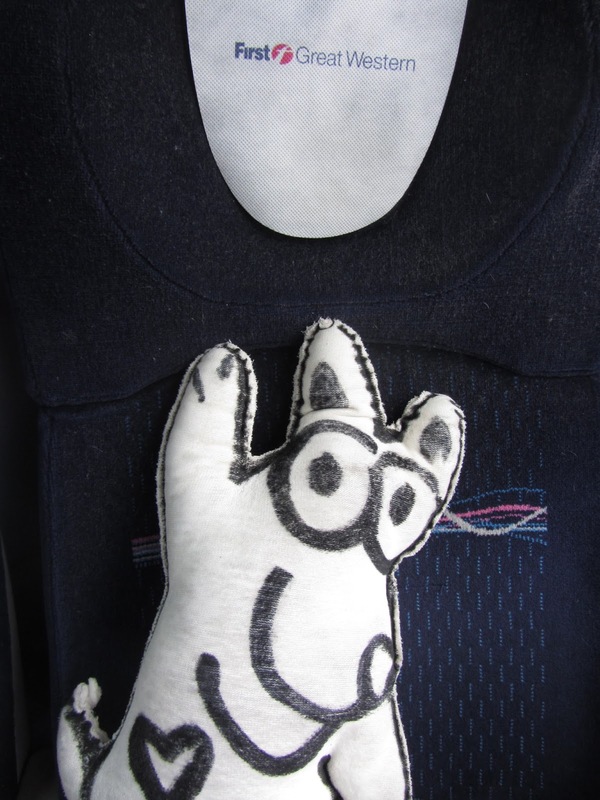 Now he freelances around the world on special assignments. He has a pretty exciting life if you ask me.......beaches, waves, and spectacular sunsets. 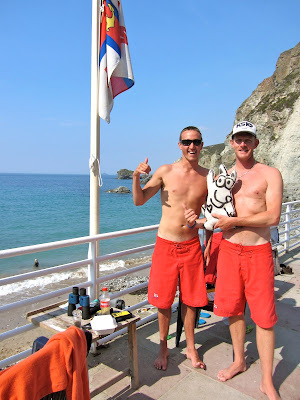 Many surfers are chased and idolized by fans. Sometimes, when they come out of the water, they are mobbed and cheered and surrounded. This competitor stopped to sign his autograph after his heat ended. Pete Hodgson is using a Go Pro which takes stills and videotapes, too. 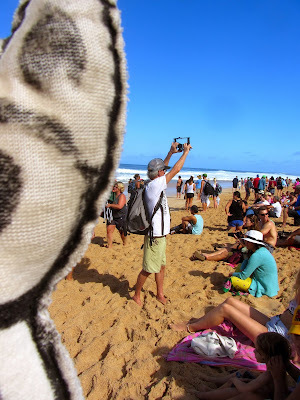 He's always on the beach documenting North Shore waves and wave riders, especially at Pipe. 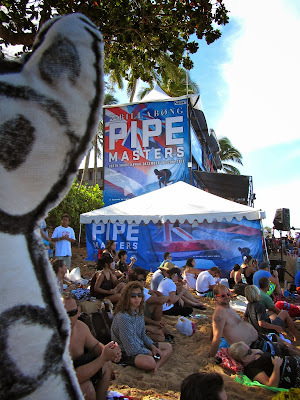 I got to the Pipe Masters about 9:30 am. The heats began at 8:00. 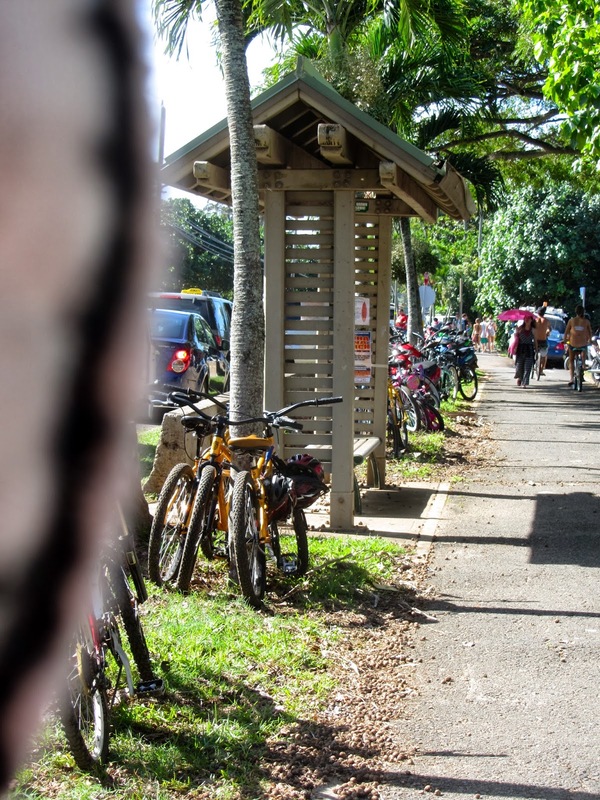 The beachgoers were arriving in droves from Honolulu and parking was at a premium. The lifeguards told me this was the biggest crowd they had ever seen and I agreed. Surfing is becoming a very, very popular sport around the world! I loved seeing all these bicycles parked along the Bike Path at Ehukai Beach Park--- the location of the Banzai Pipeline. I rode up there myself. Bike riding is my favorite sport after surfing. I just had to take a photograph of this young fellow named Devin and his cool t-shirt. I think most surfers have this motto! By the way, "keikis" means children in Hawaiian. Casey "hit the flats at Freddy's" and landed upright on his feet when he was surfing. He'll have to wear that cast for awhile. 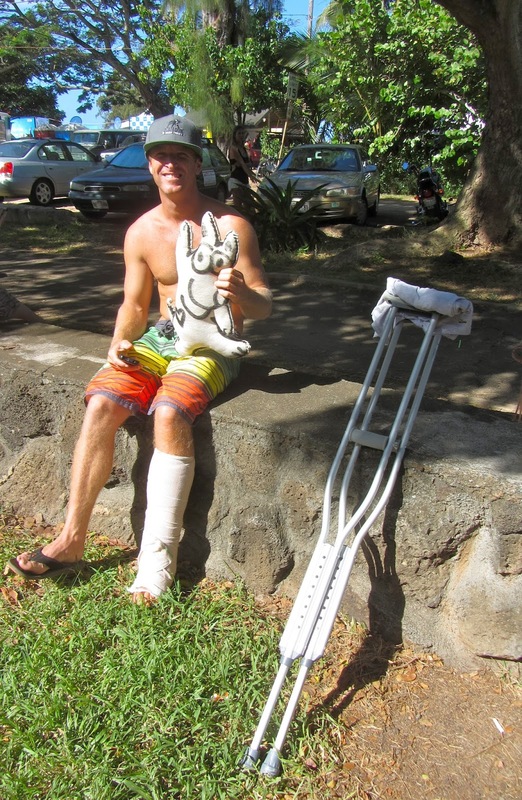 Surfing is lots and lots of fun, but it can also be dangerous. Should you decide to take up surfing, make sure you have the right board and are surfing in the right place for your ability. Take a few lessons first so you know what to do. Better safe than sorry! See you at the Pipe Masters next year. Arf! Arf! Yep, it's the Menehune Surfing Contest again, the 37th year! About 400 groms on Oahu and many from the Outer Islands compete to see who's the best wave rider of all. For many, this is the beginning of a career in professional surfing. 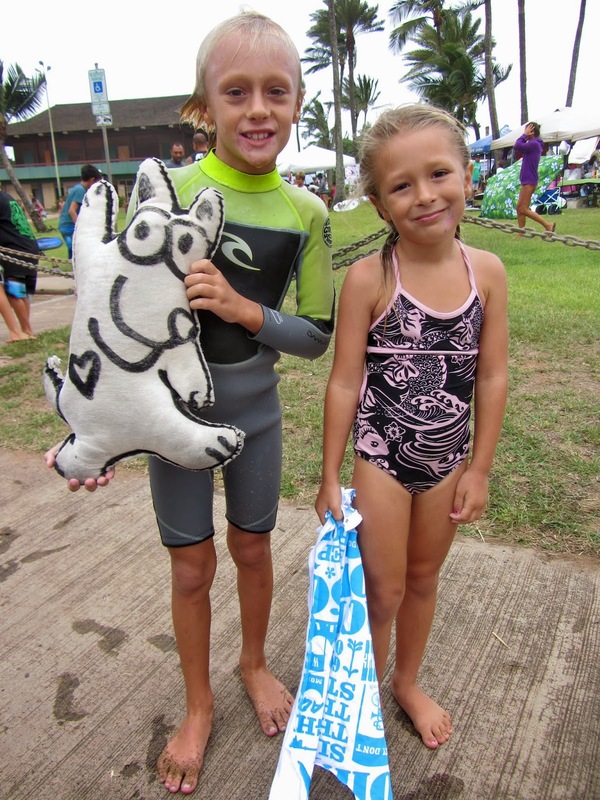 Nathan, Kaile (holding me) and Olivia are ready grab their boards and surf in their heats. 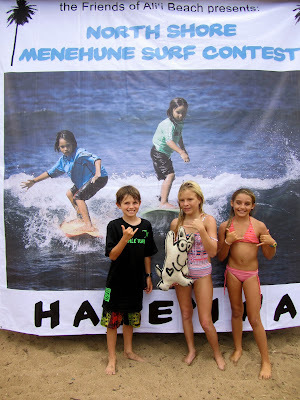 Being a young surfer in the Menehune is fun and thrilling........it's a day to play at the beach with all your friends and family. 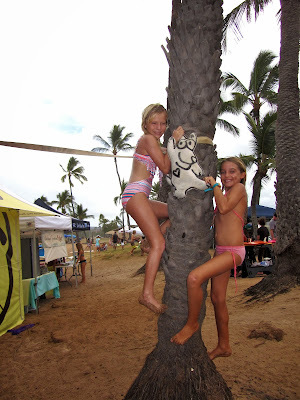 Go climb a coconut tree like Kaile and Olivia if your tired of catching waves. The whole Menehune weekend is just one big beach party! and sometimes it goes for two weekends! 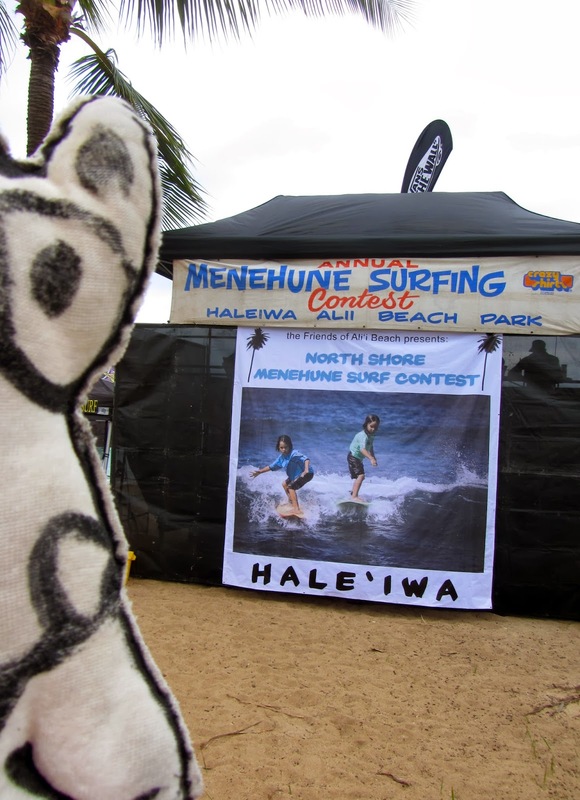 It's an all day event at the Menehune Surfing Contest. Some of the parents are really putting a lot of their energy and effort in making sure their children do their best........ and for some it's very, very serious. Sitting on the stage of the judges' tent, Kayla and her Mom and Dad are in a great position to watch the Menehune! 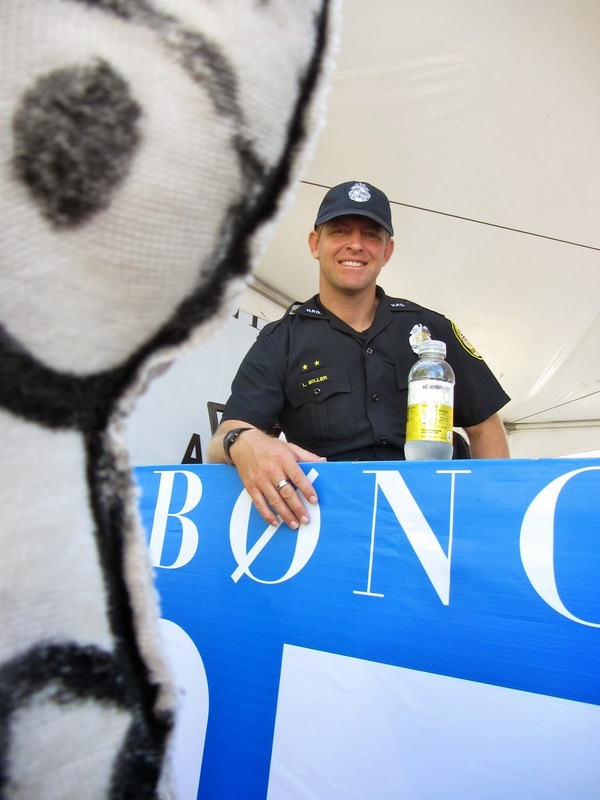 In Hawaiian, menehune means "magic little people" something like the leprechauns of Ireland. 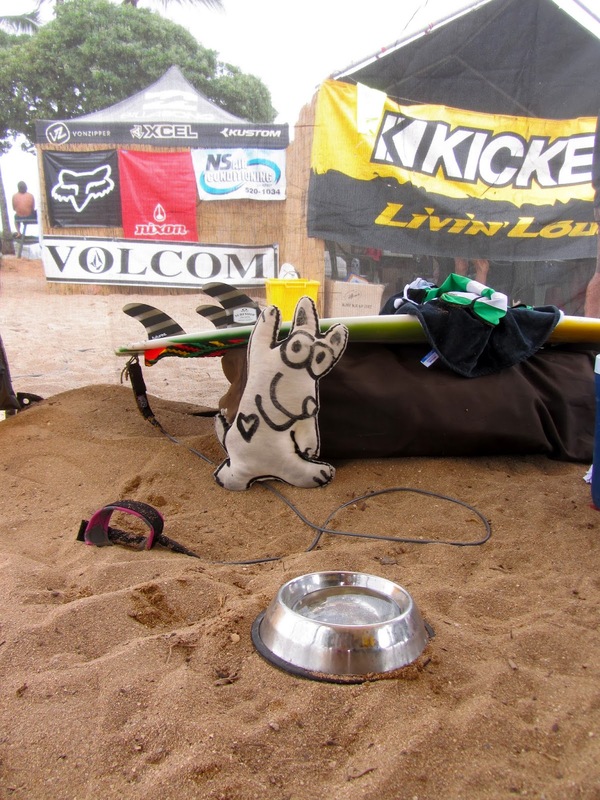 The judges have a perfect view of the hundreds of young surfers out to prove themselves. Heat after heat determines the best wave riders 12 years old and under in Hawaii. 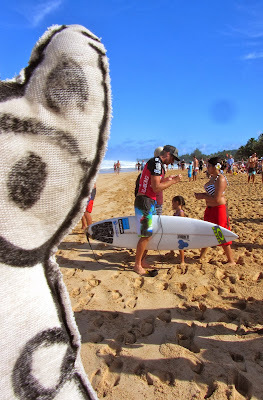 Rocky Canon is always ready to give me a smile and a hug when we see each other, and so it was at the Menehune Surfing Contest. It's such a pleasure to chat with this North Shore icon.........he's always announcing something somewhere! Educating the children to take better care of the planet was on the agenda at the Menehune. Here is Natalie of the Kokua Hawaii Foundation letting the young surfers know the importance of reducing, reusing, and recycling. 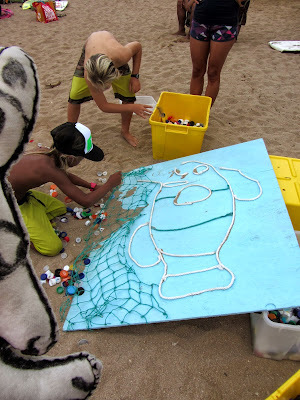 One way to recycle is to use found pieces of glass and plastic from the beach to create a big, beautiful fish. Try it sometime...........it's easy! 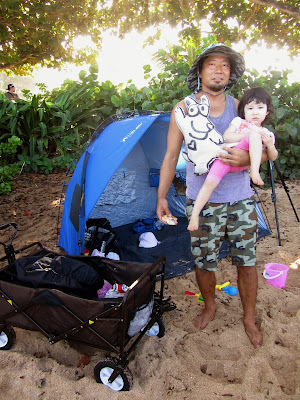 This was my favorite tent at the Menehune.............the Book Exchange. Kirra, on the left, and Alohi were overseeing the activities. Each child who wanted a book brought one to trade. I love this idea! 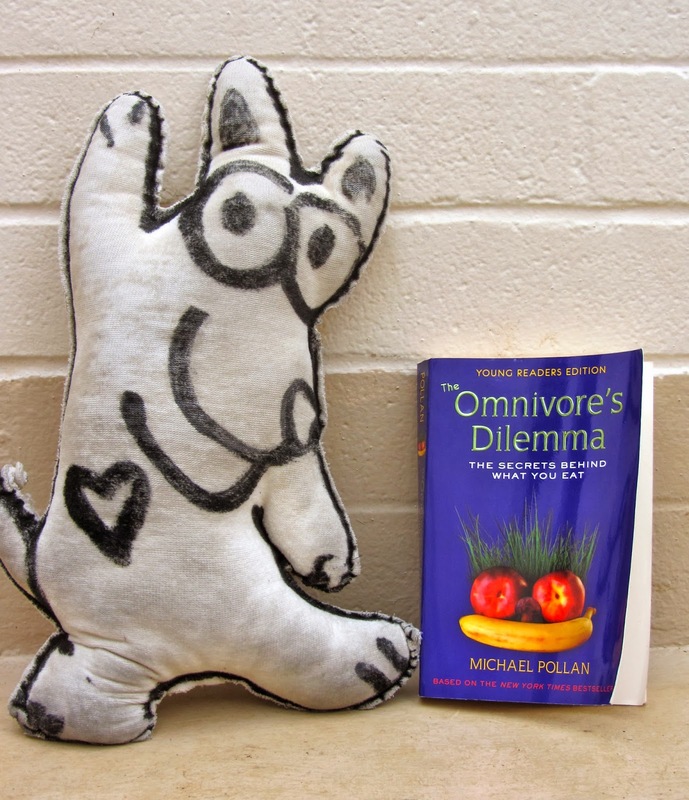 It was the brainchild of Susie Milosky and the first year at the contest. I was so lucky! I was able to take home a copy of Michael Pollen's book about eating. I know that what I put in my body is important...........junk food equals junk body.......healthy food equals healthy body!! Makes so much sense, doesn't it! These young women make the Menehune happen! 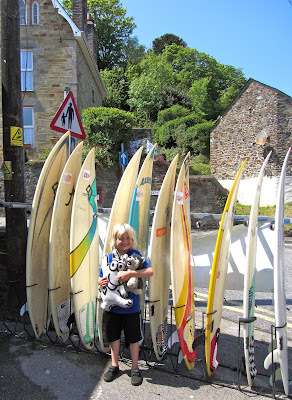 They are so full of love and goodwill and are happy to support young surfers and their dreams. 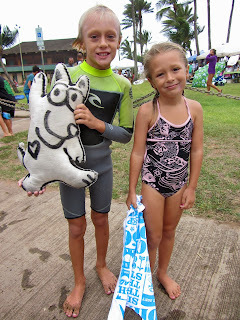 Yes, the Menehune is really great for me...........kids, books, the beach, waves, and a bowl of water with my name on it!! Perfect! I'm in southwest England in Cornwall. It's a destination for those who love the beach. The parking lot was packed and all the locals were there to enjoy the summer weather. The water was cold and the cool wind was brisk! 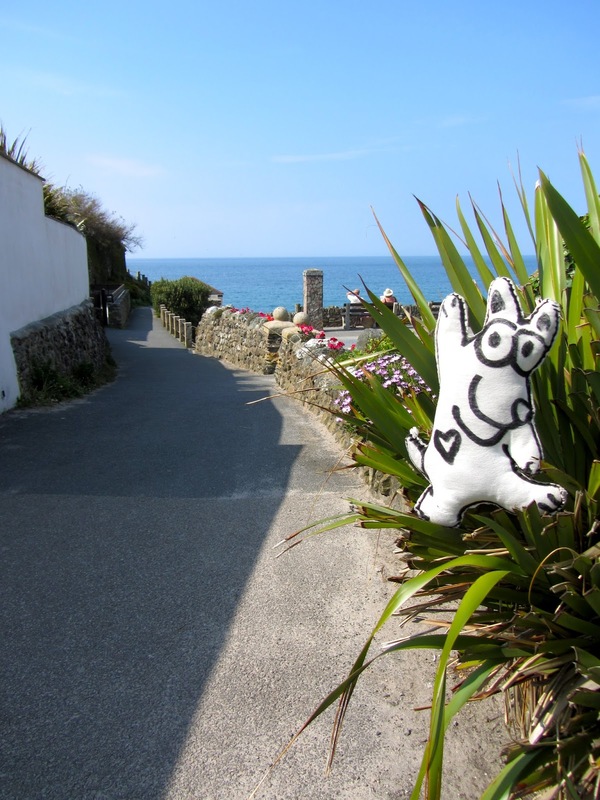 Along the coast of Cornwall, the views are spectacular. A well-worn path above the beach led me up higher and higher. What's that I see in the distance? Can you make it out? Victoria and I were trying to keep up with her dog. He was tugging hard to get to the top of the cliff. Jack Russell's are always ready to explore and get into mischief. 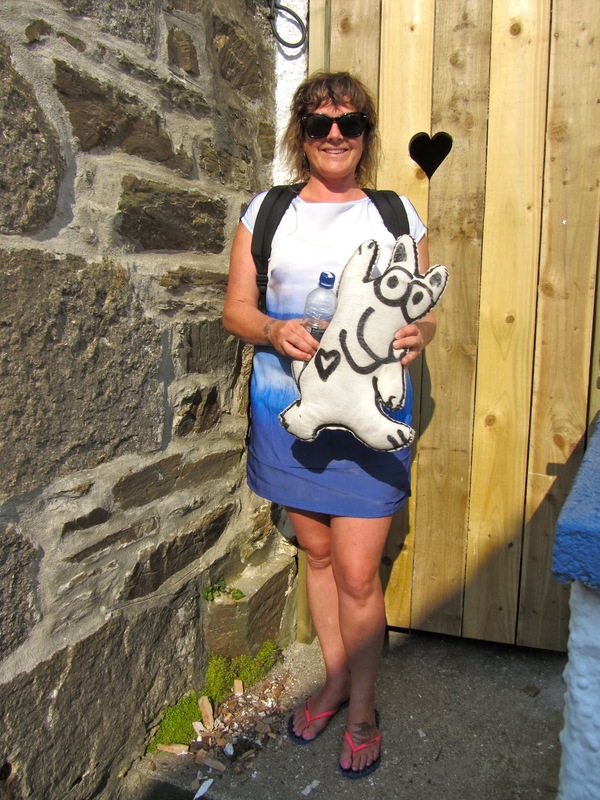 And her dog was no exception! A Fortress? A Castle? 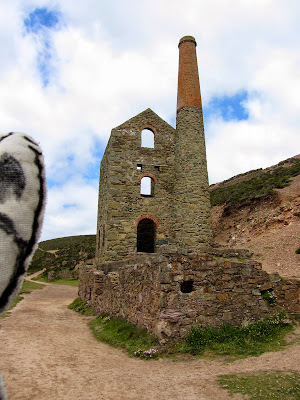 A Tin Mine? What's your guess? Well, the third choice was right. This tall stone structure is the remnant of tin and copper mines that dotted the Cornish coast in the 1800's. 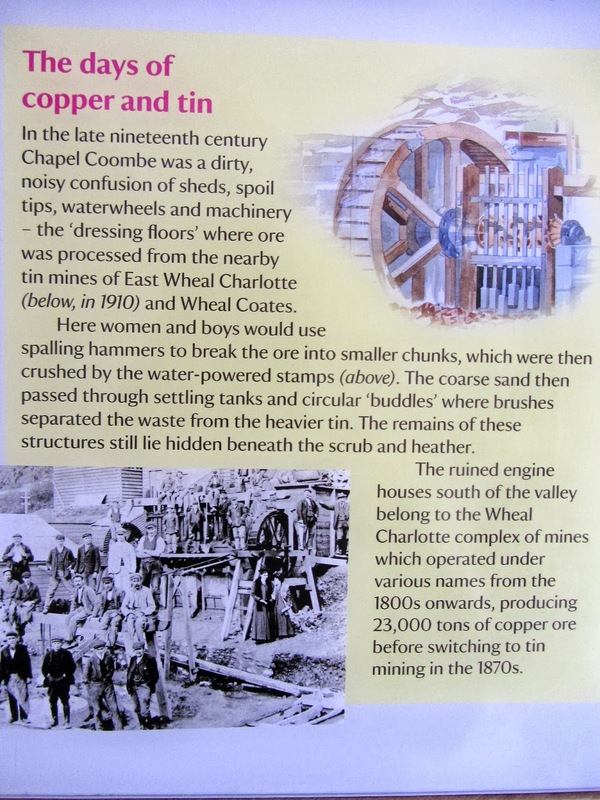 Before the mines, this area, known as Chapel Porth, was a medieval religious site. 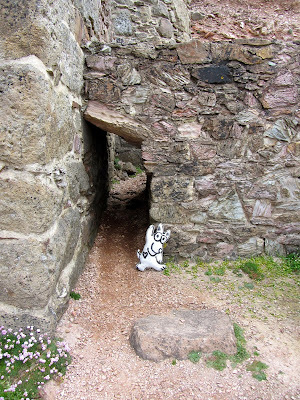 Can you believe there was a little dormouse entrance just right for me. I was super impressed with all the stone masonry involved in building this tin and copper mine engine house. Usually the piece across the top of the doorway, called a lintel, is horizontal. Hmmm...I wonder where this will take me! It was pretty slippery and I got a little nervous as I continued up the Cornish coast. Isn't this view just spectacular! The coast of Cornwall just took my breath away! Come visit the coast of Cornwall in southwest England......come during July and August for the best weather. 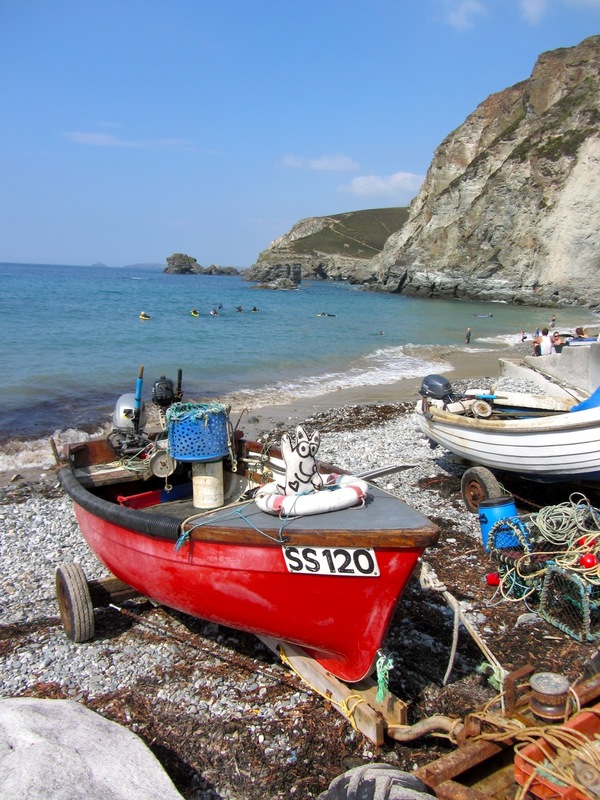 Victoria has made her home in St. Agnes, a small surfing village, in Cornwall, England. She surfs and teaches young children to ride the waves. 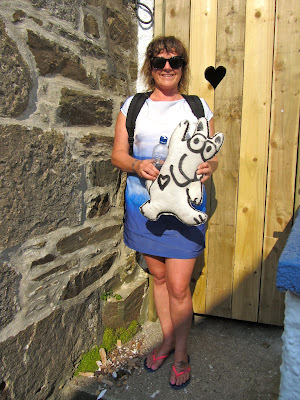 I stayed in her charming cottage just a short walk to the beach. She just had that door built. Do you think my heart inspired hers? I love Perry, Victoria's son, and he loves me. We played together a lot when I stayed in St. Agnes. 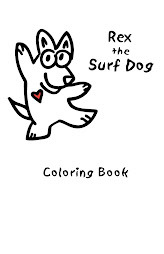 He showed me the ropes when it came to surfing. Hmmmmmmm.....which board will I choose to ride? What do you think, Perry? 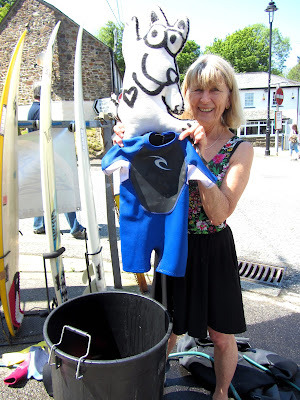 Mary owns the Aggie Surf Shop with her husband, Chops, right in the heart of St. Agnes. They rent and recycle wet suits for summer visitors as this surfing town's population explodes when the weather gets warm. Mary rinses out the salt water and prepares this "Shortie" for her next customer. Could that customer be me? Yes, surfing can be a dangerous sport! 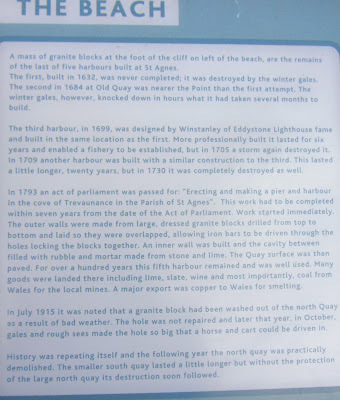 That's what Markie learned when he was riding a wave called "The Cribber" in Newquay, north of St. Agnes. He was tow in surfing, knocked off his board, and the wave pounded it into his ankle. Boooooo.....an impact fracture! His friend, Mason, is keeping him company while they chat with customers in front of the Aggie Surf Shop. Although this is lengthy, please take the time to read it. 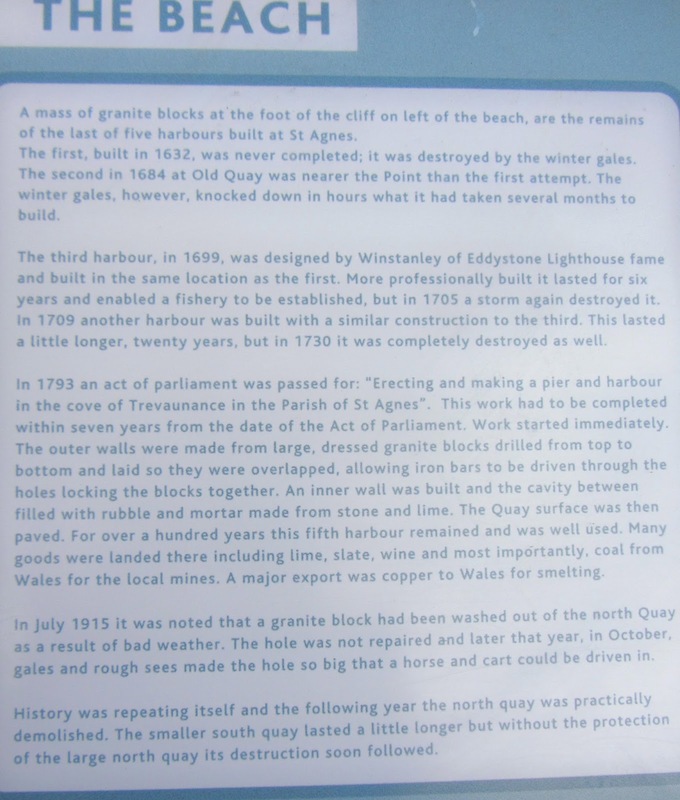 The surf in St. Agnes can be quite destructive. That's what makes the waves so rideable and this town a surfer's destination. Remember, you can click on the image and enlarge it!